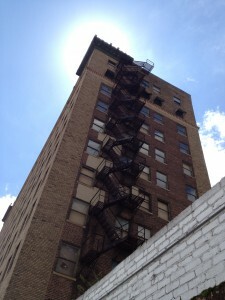 Casting a 12-story shadow over Peachtree Street and the Downtown Connector, the vacant Medical Arts Building (384 Peachtree St. NE, Downtown Atlanta) offers a lesson in how good intentions can have bad consequences on historic structures. 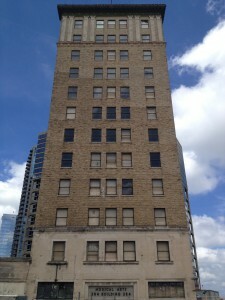 While the more than 236,000 Atlanta drivers that pass by the Medical Arts Building every day on the Connector appreciate the convenient speedy commute, it was the Connector that helped create the vacancy that currently plagues this historic building. When the Downtown Connector doubled traffic lanes in the 1980’s through Georgia Department of Transportation’s Freeing the Freeways program, the behemoth construction project destroyed old bridges, detoured major roads and closed businesses and buildings for months or sometimes years. 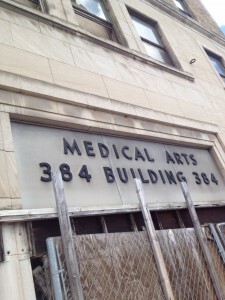 Unfortunately, the Medical Arts Building was collateral damage of this effort. 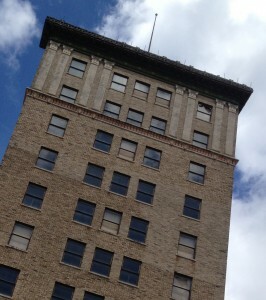 This handsome example of an early American skyscraper was opened February 16, 1927. It features tan brick, a limestone base and is topped with Beaux-Arts decorative features such as limestone pilasters. 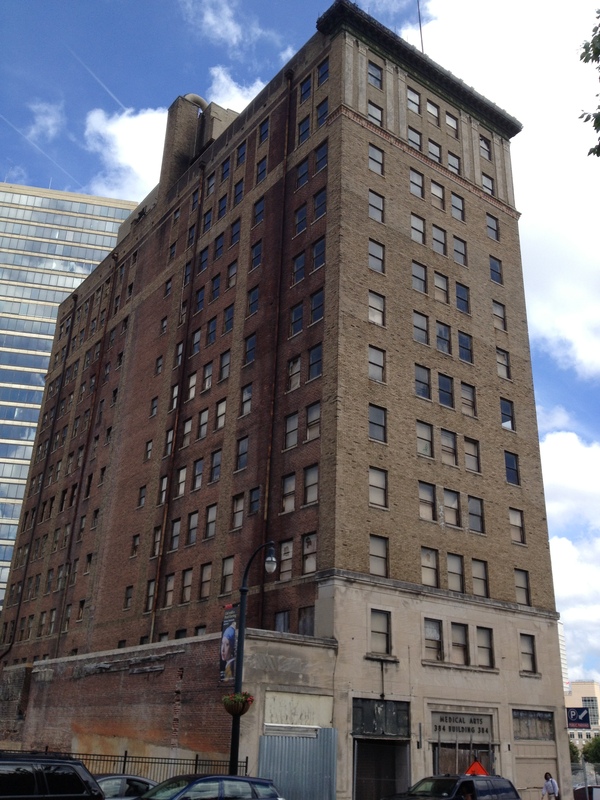 While the Imperial look and age of the building surely qualifies it for historic preservation, the Medical Arts Building’s place in Atlanta history is quite noteworthy standing alone. It was a marvel in the medical world. The main attraction was the high-tech equipment offered by this medical facility. But the building also offered several noteworthy amenities. 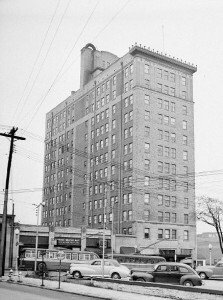 Attached was one of Atlanta’s first covered parking garages, while inside the building itself one could find a cafeteria, telegraph office, drugstore and the Junior League Tearoom (formally opened during a special sneak-peek ceremony on February 15, 1927) located on the mezzanine floor and operated by Junior League volunteers. It even had its own post office. It was designed by G. Lloyd Preacher, a notable architect in the South during the early 20th century. His designs and architectural firm changed the landscape of Atlanta. Not only did he personally draft such buildings as Briarcliff Hotel and Atlanta City Hall, Preacher’s architectural firm created the designs for many Atlanta buildings and shopping centers such as Briarcliff Plaza and Plaza Theatre. With 89,000 square feet dedicated to saving lives and curing diseases, the Medical Arts Center offered the best medical equipment available along with special medical events such as children’s clinics. Volunteer organizations, such as the Junior League and Lion’s Club, were quite active. And it remained a renowned medical facility throughout the 20th century. That takes us back to Freeing the Freeways. When this project approached the Medical Arts Building in the 1980’s, the Peachtree Street bridge was shut down for a year and the nearby Alexander Street Bridge was demolished. Local traffic ceased while tenants, doctors and practices left the building. It was choked by construction. 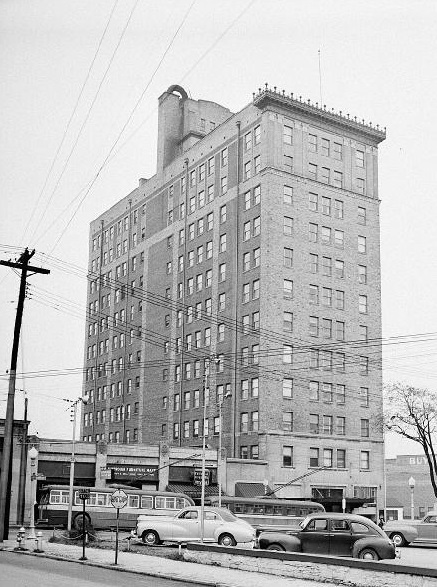 When the nearby roads opened back up placing tenants in the Medical Arts Building was a struggle. It became fully vacant in the mid 1990’s and remains empty to this day. The Medical Arts Building is an Atlanta Landmark Building and is listed on Atlanta Preservation Center’s List of Endangered Buildings. Owned by businessman Harold Gelber since the 1970’s, he sold the property in 2004 to hotel developers. Since that sale its massive frame and prime location has been used for nothing more than advertisement space. 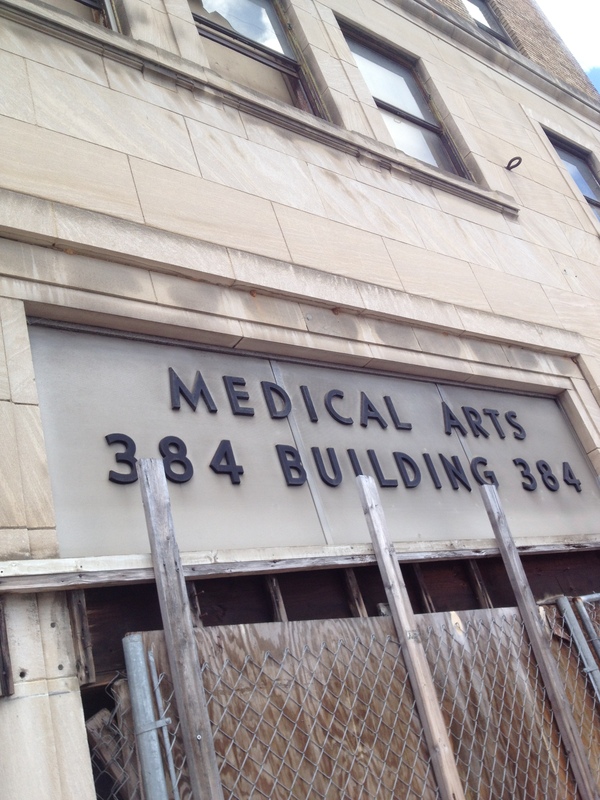 Even through neglect and the deterioration of time, along with a four-alarm fire in 2005, the Medical Arts Building offers an illustrious example of architectural and Atlanta history. Let’s hope the current owners are devoted to historic preservation. Did You Know? The Freeing the Freeways program that significantly changed the I-75/I-85 Downtown Connector lasted 17 years, cost the state of Georgia roughly $1.5 billion and doubled Atlanta’s total freeway lanes.